Goldie Boyce opened Boyce’s Boutiques on Main Street, Blue Hill, in 2016 and will close it March 30 to pursue other interests. Main Street designer and gift shop Boyce’s Boutiques will close on March 30, owner Goldie Boyce recently announced on the store’s Facebook page. However, her decision will not leave an empty Main street-facing downtown storefront for the summer season, as Moyo, the gifts-and-goods shop around the side of the building will move into the space. 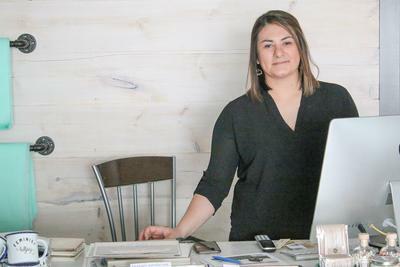 “This smooth transition gave me the opportunity [to close],” Boyce said, as Moyo owner Jill Clendenen will take over the existing lease. Boyce opened her boutique in late spring 2016 as a young Deer Isle woman with a degree in nursing and a love for designer blue jeans. A second store in Bar Harbor followed, which she shuttered at the end of the 2018 season. Boyce will continue as a behavioral health specialist at KidsPeace in Ellsworth “and decide where I want to go from there,” she said. Her boutique’s mix of baby clothes, gifts, body care products, jewelry and designer clothing for adults will all be marked down when she opens for a final sale on Friday, March 29, and Saturday, March 30, from 10 a.m. to 4 p.m.